South West Maritime Academy is running an Efficient Deck Hand course in early September 2018. Including seamanship skills, rope work, rigging and the Code of Safe Working practices. South West Maritime Academy is running a 4-day Efficient Deck Hand course. They’re based at an awesome old quarry in Gloucestershire, and are purveyors of the very finest maritime training. 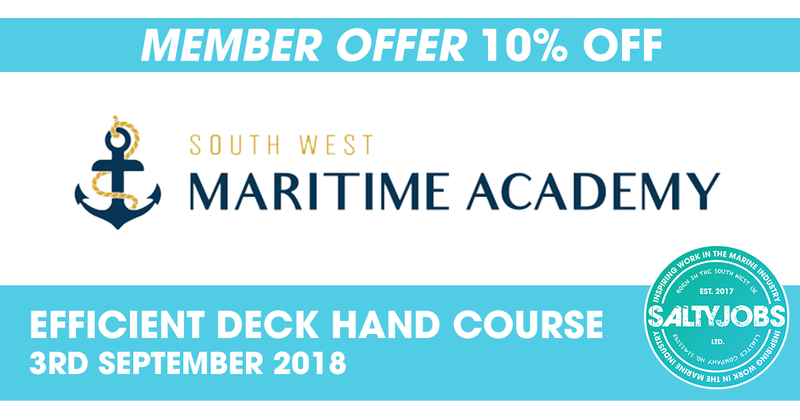 We’ve been working with South West Maritime Academy for a little while now, and are pleased to launch this latest offer. SaltyJobs members can get a fantastic 10% off this course. The Efficient Deck Hand course is a fantastic investment for anyone working on bigger yachts. From tall ships to super yachts, this is a requirement if you want to progress to your MCA Officer of the Watch certification. This is also aimed at experienced seafarers, with prerequisites mentioned below. Using your SaltyJobs discount brings this down to less than £500. This really is fantastic value not only for your career, but as an investment in your skillset & self-confidence, whatever your background. P.S. It sounds so good, our founder Eleanor is going. You can read more about each of these sections of the course on South West Maritime Academy’s website here. Upon successful completion of the course participants are awarded an MCA-approved certificate. This course is a requirement for the issue of an Officer of the Watch (Yacht less than 3000 Gt) CoC and also for the Able Seafarer Deck Certificate Regulation II/5. Important: Before an EDH certificate can be issued, a minimum of 6 months sea service onboard vessels 15m+ is required. South West Maritime Academy have a fantastic reputation for extremely high quality training. They are based at their own quarry in Gloucestershire, 25 minutes from just Bristol or Gloucester. This is a great part of the country, home to many fantastic shipyards and tall ships, with a community of its own useful to know about. The week will run from Monday 3rd September to Thursday 6th September 2018, 09:00-17:00 hours each day. Price £550 per person. 10% SaltyJobs discount brings this down to £495. A great investment in your career, and unlocking the pathway to higher MCA OoW certificates of competency. This includes the cost of the 4-day course, all associated materials, and your certificate. You will need to arrange your own local accommodation but South West Maritime Academy can help with this. Can’t make these dates? South West Maritime Academy offer a 5% discount on all of their courses to SaltyJobs Crew Members (not compatible with other offers), so you can still take advantage of this.